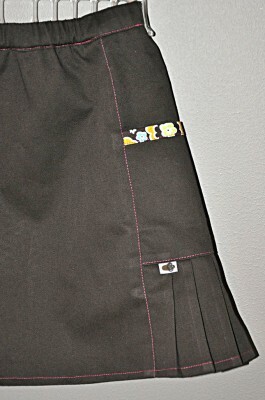 This Music Class skirt was sewn by IsabelDecibel, and I love how she added contrast trim to the top of the pocket. The contrast stitching is a nice detail, too. 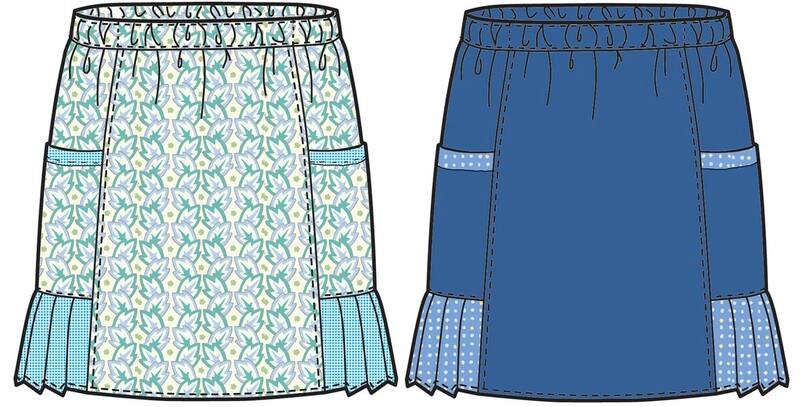 I was thinking the contrast fabric might be a cute option for the pleats at the sides, too. But maybe it’s too much. I think it works very well with the solid. I’m not so keen on the print though; however, I do like still like the pocket trim. 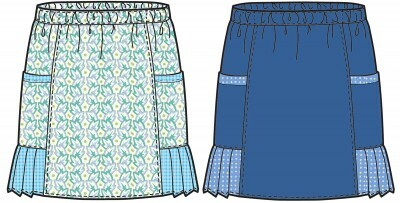 I like the variation with the solid skirt and patterned trim and pleats. I’ll have to try that next time. Not sure if it would work in a combination of fabrics (twill/cord + quilting cotton)? I was also thinking if it would be possible to put some tulle underneath the pleated panel, maybe if it had gathers instead … or would that look weird? I like them both for little girls. I’d love to have that pattern in ladies sizes! I agree it would look great with a solid color skirt. Not so great with a print. Then again some kids can pull off anything. I love the idea of the pocket trim, and the topstitching is also wonderful. My daughter asked for contrasting pockets on her first-day-of-school outfit, and I just couldn’t bring myself to do it. I’ll post my solution up on the flickr group pronto. I admit to feeling a little proud of what I came up with. Hi Cricket – your idea was great! Love the ‘secret’ pocket! I like the idea of contrasting pockets and pleats. I like the way IsabelDecibel used the print just on the pocket, a very sweet detail. A contrasting (or coordinating) fabric with a solid or two complementary prints could be adorable paired with a solid top. It looks great with the contrast…walked in my local sewing shop last night for our monthly SAGA meeting and one of the sample garments hanging in the shop was the Music class skirt and top. The pleats were done in the same fabric as the top. It was soo cute…so it is definitely an option!